This post is a real hodgepodge. I'll start with this little cheddar and indigo quilt top. Sandy (my material creations blog) recently had the good fortune to receive a bundle of old indigo scraps that appear to be leftover cuttings from clothing construction. She has been kind enough to share and there are a few of us participating in a small quilt challenge incorporating the indigo scraps in any way we choose. When I think indigo, my mind immediately follows with cheddar, and I knew what I wanted to do with these lovely blues. But Sandy cautioned that the fabrics were on the thin side and they frayed easier than what we are used to using. So I decided to do a "trial run" little top to get a feel for working with them. That would give me a chance to see whether or not my idea would work. 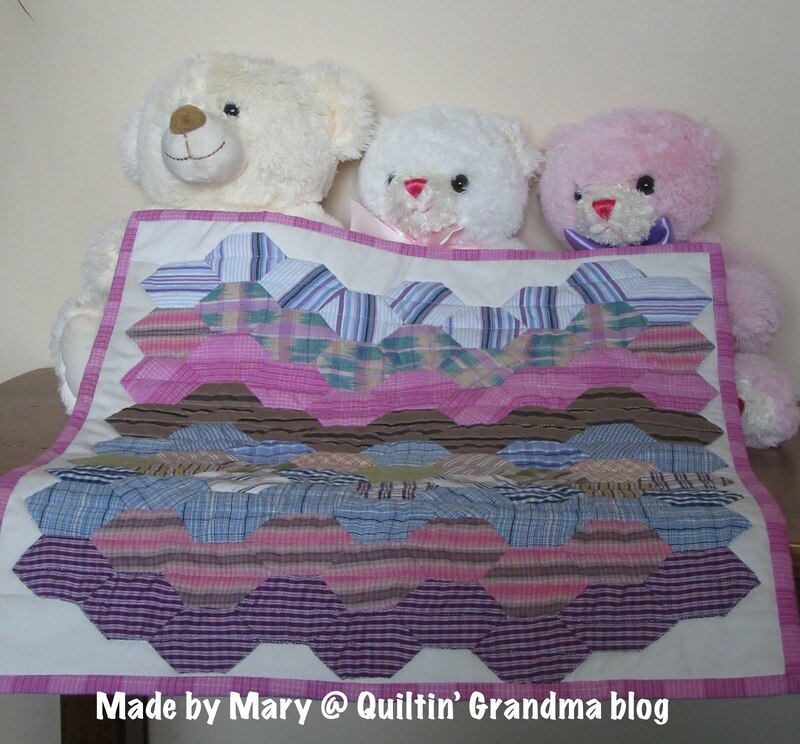 I have always admired a little quilt Marian Edwards (Dream Weaver blog--scroll to the bottom of her post) made back when the Panama Pyramids craze was in full swing. It was the inspiration for this, but I switched the placement of the cheddar in my quilt. I wanted to show off the indigos. After working with the fabric, I think I may be able to go ahead with my original plan, if I am careful. Thanks, Sandy, for the chance to work with these wonderful vintage fabrics. Can't wait to see what the others create. While digging for some particular scraps this weekend, I came upon my ancient string project. Just so you know, I don't love working with strings, but many years ago (like, more than 10) I took a class on foundation piecing with no pattern. Sounded interesting. We worked on 3 projects. One was finished into a quilt and donated. One was given away to someone who was more interested in finishing it than I was. And this one has been in a box for longer than I have been blogging. But Lori (humble quilts blog), who has been hosting a string-along, encouraged me to at least pull it out and look at it. So I did, and I do like the look of it. My design wall looked like this earlier this week. I got all of the Scrappy Trips blocks made. I need to press them and square them up before I start assembling them. I pulled out my Kansas Troubles fabric and found the light piece I wanted to use for the inner border. But I didn't have enough of anything I liked for an outer border (I want this bigger, but am so done making these blocks--started this in 2013). So I ordered a piece from an etsy shop. Always risky--not knowing the true colors, but it is a Kansas Troubles fabric and they usually work pretty well together. Now my design wall looks like this. These rows are not sewn together. I haven't trimmed the dog ears yet, and I am pondering whether or not to stay-stitch the edges, as some have recommended. Every other row is made with blocks I received from someone via swaps. It is fun to be able to look down a row and recognize the person who made them based on their style and color preferences. But I won't leave it all to memory. I am planning on labeling each row with the maker's name. If you look closely you may spot a rogue block. Last week at our Circa 1880 Club meeting it was mentioned that someone was making the quilt King Size AND they wanted to add a border around the edge of 2" basket blocks--with appliqued handles! It is a guy who works part time at the shop that is doing all this. Then someone else mentioned that it would be fun to put 2" baskets mixed in the quilt. I thought about that, and ended up deciding, "Why just baskets?" So right now my plan is to include a 2" log cabin, pineapple, star, and one or two other blocks. There will just be one of each, randomly scattered through the rows I make out of my own blocks. I like giving that little tweak to the design. I guess that covers things for now. Hopefully it won't be another two weeks before I can put another post together--but don't hold your breath. 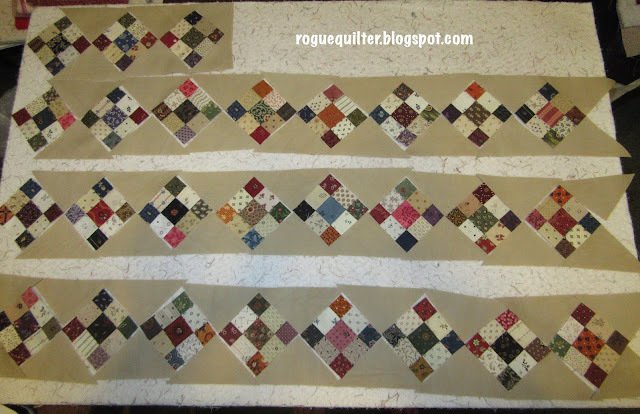 The Circa 1880 Quilt I am making as part of Pam Buda's Circa 1880 Club involves lots and lots of uneven 9-patch blocks (aka Puss-In-The-Corner blocks).There are 500-and-something of them in the finished quilt as designed by Pam. 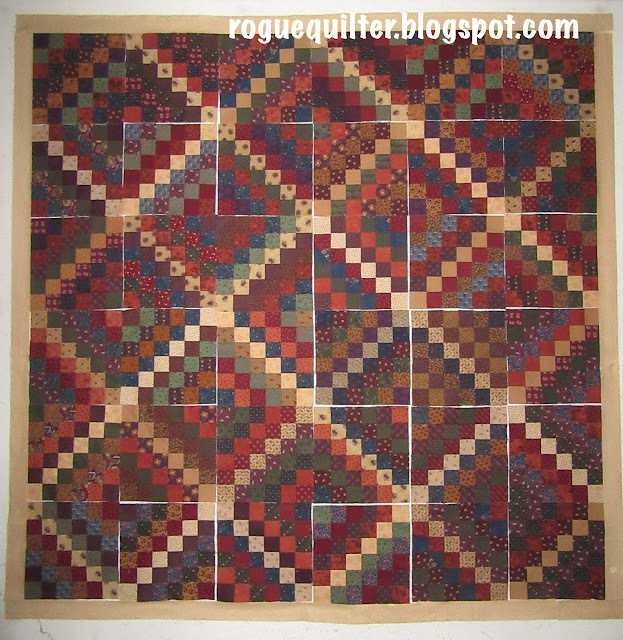 I am making my quilt two rows longer, and two rows wider. It is all that I have worked on in the two weeks since I last posted, though there is not much new to show. Here is what I have so far--hasn't changed a whole lot since my January retreat. I have sewn a lot more blocks since January, but haven't made many more rows. There are 13 rows completed (or almost completed)--the bottom three in the photo still need to have their ends finished. I will make at least 12 more rows. These are the blocks I have left of the ones I have made that are ready to use. There are 135 blocks here. These are the blocks I have sewn, but have yet to press and trim. There are 125 blocks here. I have swapped with 7 quilters and these are the blocks they have made that are yet to be sewn into rows. There are about 160 blocks still to come from swaps. Seven of the rows in the top photo are made of blocks I have received in these swaps. As much as possible, I am making the shorter rows each from one quilter's blocks, and I will write their name on the end of the row made from their blocks. And here is the next row laid out and waiting by my featherweight for the next time I can sit down and start stitching it together. I am sure you will be seeing a lot of this project in the future. I hope to complete the top at some point during the year. The quilting will most likely wait until I have some other projects completed. Pam's is quilted with beautiful, small feathers, but I am considering an allover Baptist Fan design. 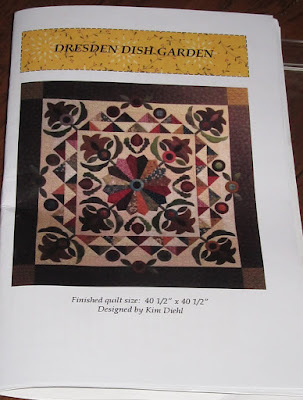 I will be starting to work on a fun mini quilt challenge soon. I am looking forward to sharing that with you as soon as I can. This is actually my second mini quilt finish for March (highly unusual for me to have even one finished this early in the month, let alone two). The other one is in my previous post. 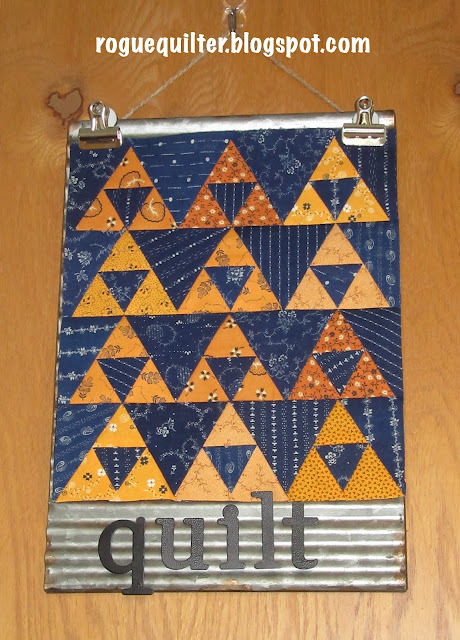 I couldn't decide which one to let claim the honor for the Mini-a-Month challenge with Wendy (The Constant Quilter blog). They are both Pam Buda patterns. 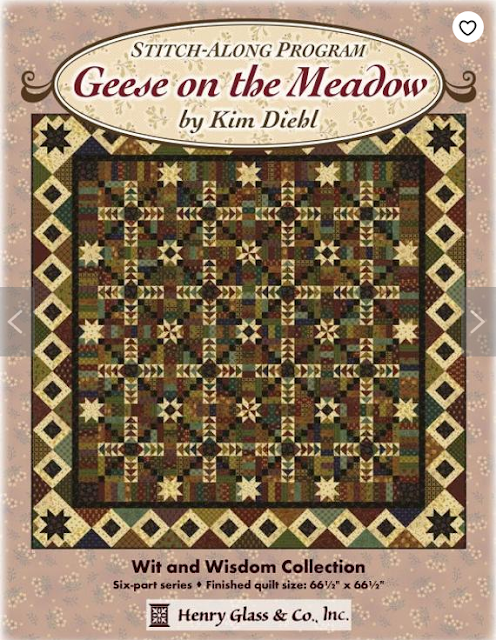 This one is from her book "Vintage Patchwork." Wendy is also sponsoring a SAL for the projects in this book, but I can't keep up with both. May I introduce you to "Emma"? She really is a tiny thing. I've been showing her around the house and maybe a couple of those shots will give you a better size perspective. Here she is beside her namesake. Yes, I love Brit Lit, which is one of the reasons I love the names of the little quilts and projects in this book of Pam's. I think I have read 10 of the 12 books whose titles she used--most of them multiple times. And this is where Emma will reside for the next little while. There is a story behind how I came up with the color palette I used. When I was at retreat back in January, on the last night you may recall that I shared how almost all of the participants had packed up and gone home hours before we had to vacate the building. I was furiously focused on my project as people were gathering their things and saying their good-byes, and when I heard someone announce that they were throwing away scraps larger than an inch, I didn't even look up. Now that is focused! A couple of hours later I made my way to the large and almost overflowing trash bin to empty my thread catcher before packing up to go home. Sitting on the top of the heap, in a cardboard tray, was this amazing collection of scraps! They were pristine--no food scraps had been dumped on top of them. They were just sitting there waiting for me. The largest pieces were folded and if you ignore the pointy corners they measure 3"x6". The smallest pieces are 2"x3". In my world those are huge! And there were four pieces of almost every fabric. In order to make "Emma" I added two other fabrics in colors that matched a couple of the scraps, and I added the background fabric. I also pulled small bits of fabric from my scrap basket for the binding and backing. And I still have a lot of these little bits left for another small creation or two. This shows you the backing, binding and quilting a little better. 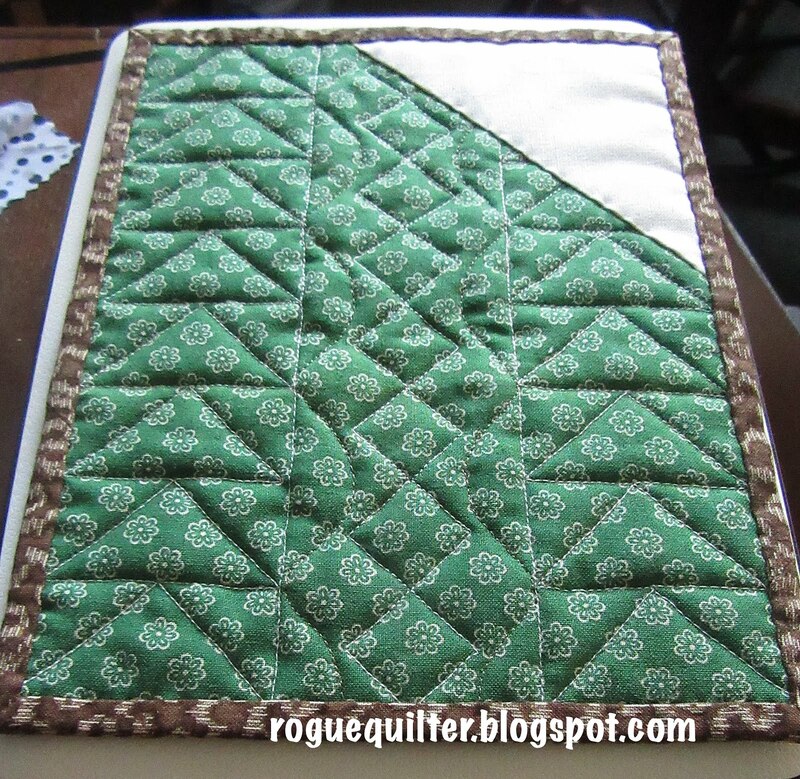 I keep the quilting pretty simple on pieces this small, not wanting to overpower the piecing. 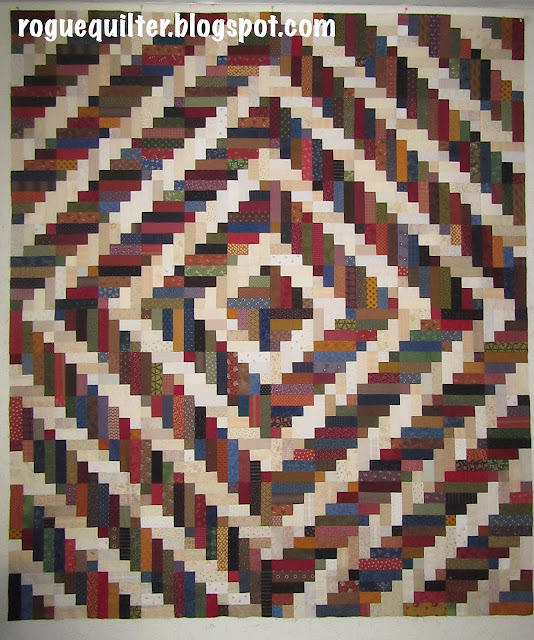 The half log cabin quilt top is finally off the design wall. I pushed my way through putting borders on in a timely manner. It is too big for the wall now, so I have it on the floor for this photo, and I am up in the loft, leaning over the railing to get the shot. 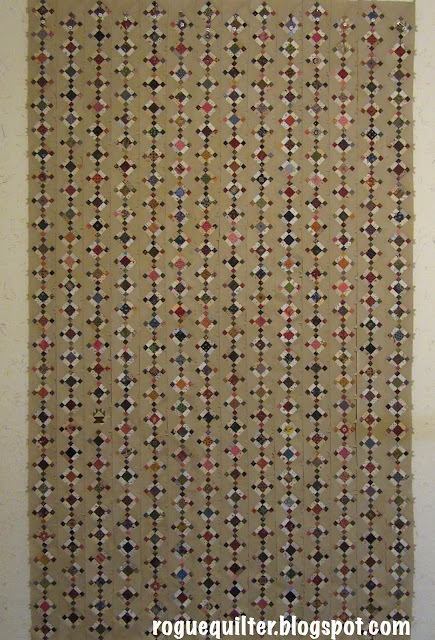 The final border is similar in color to my carpet, but I think you can tell where the quilt ends and the carpet begins. This is what is on the design wall now--my version of Bonnie Hunter's Scrappy Trips. You may recognize it as one of my projects from my retreat--for the last two years. It is all in Kansas Troubles fabrics collected for various projects over the years. I only need 6 more blocks along the bottom before I can put these together. I have them all laid out on design boards, ready for when I have a few minutes to make a quick block. 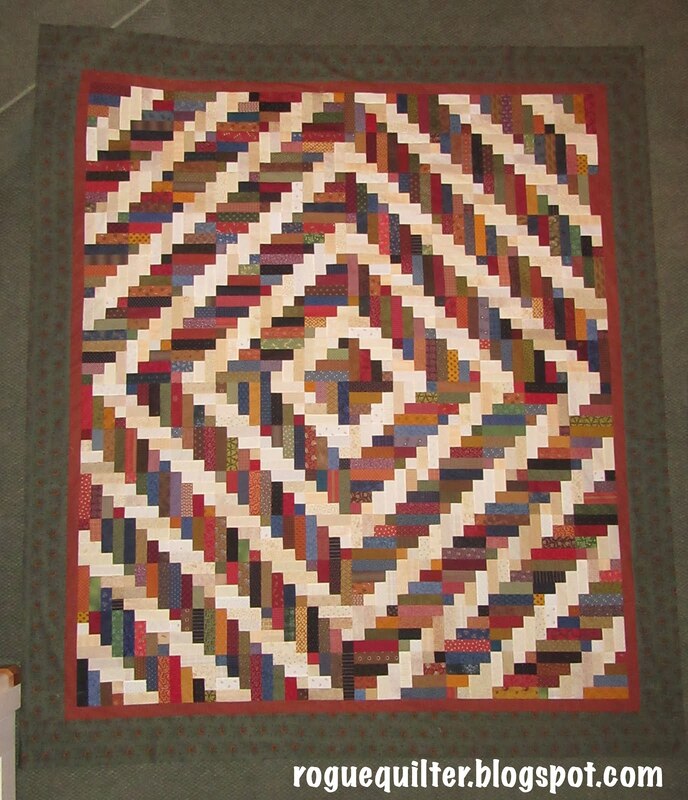 I started this quilt in January of 2013 when the Scrappy Trips quilt-along was sweeping across the country. It has been in hiding (other than the last two retreats) for much too long. I am excited to be breathing life into it and hope to have the top finished soon. I do believe I will border it to make it a good bed size. It is pretty shocking that I am finishing quilts this year that are large enough to keep a real live person warm, instead of just decorating a wall or table top. The quilt for my Mom (made from my Dad's shirts) is finished and delivered. Really happy with how it turned out. 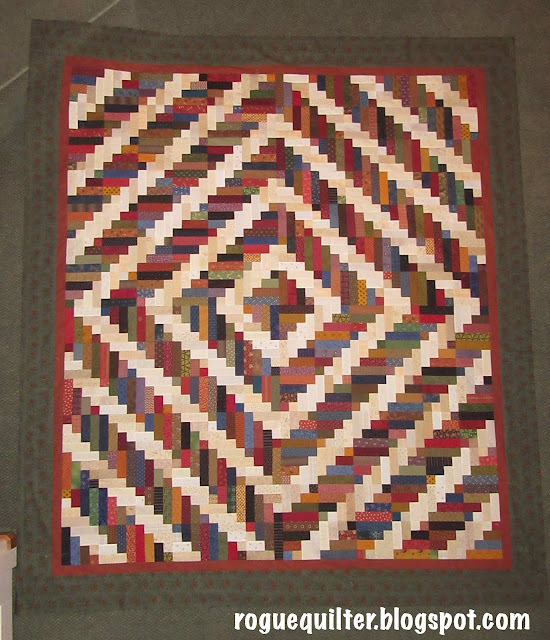 There is enough quilting to look nice, without being so much that it felt stiff. After washing it was soft and cuddly. Mom was very happy with it. For all the quilts she has made, she only has two at her house--the one hanging behind her sofa that you can see behind her in this photo, and the one on her bed. On the label of this quilt I explained that I quilted hearts on it so Mom could be wrapped in Dad's love. I also finished off my Pam Buda Circa 1880 Club Small Quilt #1. Couldn't resist feathering this outside border, and I rebelled against the directions that called for dark blue binding. I auditioned red, purple and pink for the binding--red won, obviously. Another finish (kind of--it is a flimsy) is the half log cabin top. I started this just a year ago this month, a couple of weeks before I had shoulder surgery. You can read about it here. I want to put a border or two on it. It will be for our youngest son one day. I took it up to our bedroom and laid it over the bed to see how much bigger I want it to be. That will play into my border decisions. Now for the fun mail. I received my little swap quilt (made from thrifted shirt fabrics) from Mary (quiltin grandma's blog). She used honeycomb shaped English Paper Piecing. I love it when I get a quilt made from a method I don't love to do--because I always like the look, even if I don't enjoy the process. I took several photos, but this was the one I liked the best, posing it with some Valentine Teddy Bears I had yet to put away. Mary appliqued the edges to the border and then did straight line machine quilting. I especially love colors from the purple family that sing out from this cutie. There were a few goodies tucked in with the quilt (hmm, looks like the chocolate has dwindled a bit). Thank you for a fun swap, Mary! More fun mail--Barbara (my joyful journey blog) has been selling some things from her sewing room. When it came to the quilts, I jumped at the chance to have this one come live with me. The final fun mail was this FQ that arrived from Wendy. I had recently lamented using the last bit of this fabric on the back of a quilt. Soon afterward Wendy discovered this among some FQs she won at a guild meeting, and she sent it on to me. Thanks so much, my friend! There has been more activity in my sewing room lately than it has seen in quite a while--and it has been fun! Mary (quiltin' grandma's blog) and I had talked about swapping small quilts back in 2017, but mutually agreed that "next year" would be better for us. When 2018 rolled around we scheduled our swap for September. As the deadline drew closer--again, by mutual agreement--we scooted it into January of 2019. But as my January progressed, I knew it wasn't going to happen. We pushed it into February, and I'll admit that at one point I wasn't sure if I was even going to make that--but I did. This is what I "finally" sent to Mary. She has received it now, so I can share it with you. 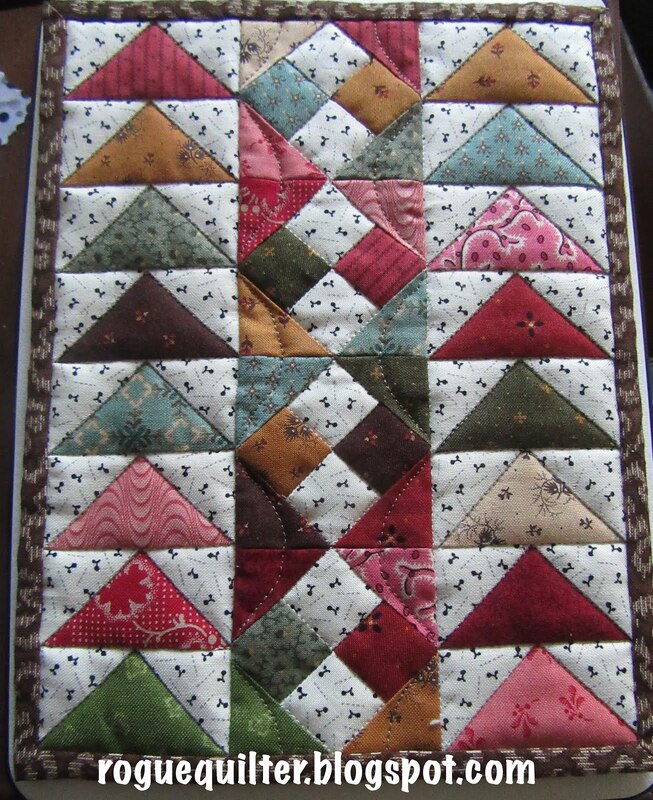 Her quilt is due to arrive here in a few days, so I will share it in my next post. Our swap was not real specific, other than the fact that we would use fabric from thrifted shirts to make a small quilt. I tried to choose colors I know Mary likes, and other than that I was flying by the seat of my pants. I made the HSTs with a specific design in mind, but as I laid them out, it didn't work for me in these fabrics. I must have changed the layout about 5 times before settling on these sampler star blocks. I think this finished at 14 1/2" square. 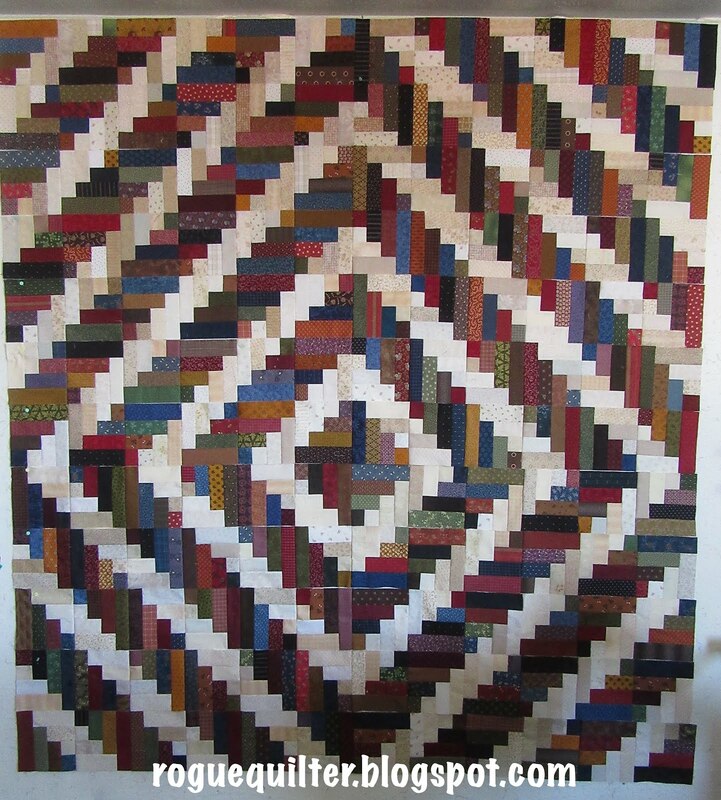 Most of the quilting was SITD. I often do that on minis, and throw in something else in the border. 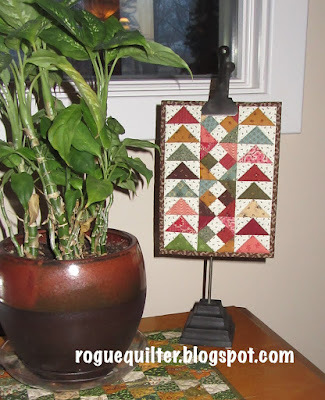 This is also my February mini-of-the-month for the challenge with Wendy (the constant quilter blog). How unusual for me to be posting it before the very last few minutes of the last day of the month! ...and now I have the binding cut, sewn together and pressed in half. It has been so long since I have bound anything but a mini quilt that I almost forgot to cut it wide enough for double fold binding. Whew! That was close! Monday I will attach the binding and I will work on hand stitching the other side in the evenings next week. It will get a label and a good wash to remove all of the markings. I am anxious to get this finished and delivered to Mom--hopefully before the week is over. My last little progress report is not a "finally." I just started it last month. It is the first of the six little quilts that are part of the Circa 1880 Club. These little quilts all use some of the same uneven 9-patch blocks that are in the featured club quilt. You can click these photos to get a better look. 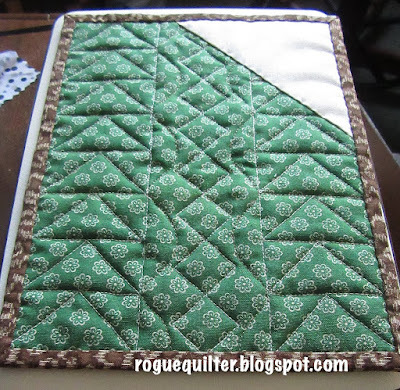 The second photo shows the quilting and the backing fabric, which I LOVE! I drew a name from the 25 interested in the Kim Diehl project--well, actually I drew 3 names. The first two were "no-reply" comments, so I can't make contact. I appreciate it if you include your email address if you aren't sure whether or not you are "no-reply". Marj (eclectic quilter blog) was the winner of the drawing and I will get the kit on the way to her as soon as I confirm her address. That about wraps it up. Thank you all for your kind comments and faithful reading. I really appreciate the friendships I have made here. It is always a bright spot to check in with your blog, or hear from you via comments or email--or even texts. Where did the first half of February go?? And what do I have to show for it? Not much. Well, there's this (yes it is crooked). With Pam Buda's Circa 1880 Club there are patterns for 6 little quilts that can be made throughout the year using more of the little uneven 9-patch blocks. This is the first one, and I have pieced it this month using a stolen minute here, a few more minutes there. Because it was assembled in such a disjointed manner, I feel like I didn't have the focus I needed. The distribution of color bothers me--I did unpick one part of a block because there was too much of one fabric too close together. But when I saw how many places were like that, I stopped after the one repair and decided to live with it. The neutral around the edge is being auditioned for the final border, and then it is bound with a dark color. I am still deciding if I will use a neutral, or if I want to make that outer border with a light or medium color. After I got Dad's history printed in December, I went to work on this. 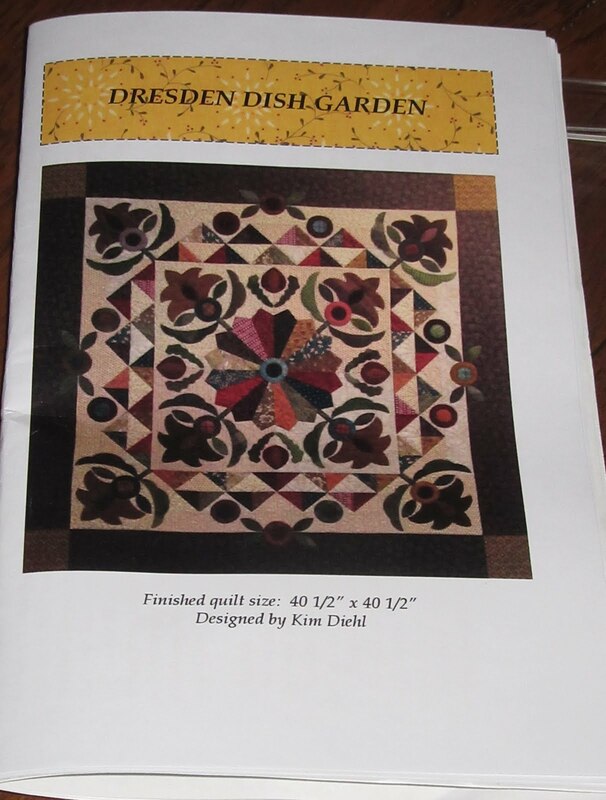 Mom's birthday is on Groundhog's Day, and I had to scramble to get this put together in time--fifty pages of the quilts Mom has made. 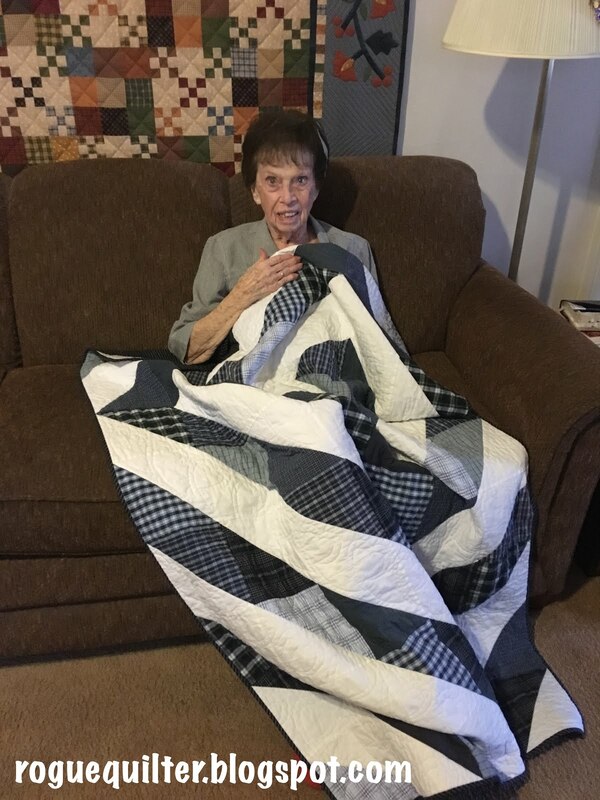 She chided me for not using a younger photo of her on the front, but the one I used shows Mom with the quilt she made in 1991 (but the photo was just taken 2 years ago). It won sweepstakes at our county fair, our state fair, and it went on to hang at the International Quilt Festival in Houston. The piecing was simple, as you can see, but what you can't see are the tiny stitches on the feathered wreaths in the white spaces. 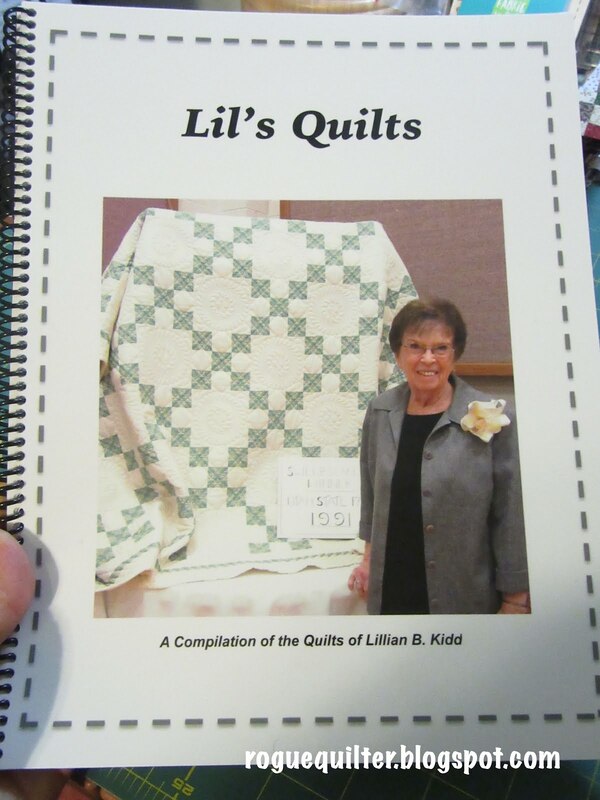 Her hand quilting was impeccable. It was fun to sit with Mom on her 89th birthday and watch her go through the book and reminisce about the quilts she has made. I have to share my Valentine bouquet. 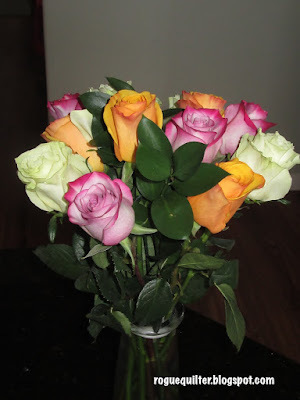 DH and I were in town together early in the week and he asked if I would like to pick out my own bouquet. When I saw this bouquet I could not refuse. Purple (they look more purple in real life) and cheddar, with a neutral background! Now I want to make a quilt in these colors, adding the dark green of the leaves. This project has been gathering dust on my shelf (not really--it has been in a box) for a few years now. I took a class from Kim Diehl, and I haven't touched the project since I brought it home. It isn't that I don't like it, but I know I don't have anywhere to hang a quilt this size. And I don't love it enough to work on altering it. If you would like to rescue this UFO, let me know in your comment. I will draw a name if there is more than one person interested. We had to come to the class with everything cut and ready, so it is all prepped. It includes everything for the top, except the floss for working with the wool. But the wool is all there. This is a close-up of the pattern to give you a better idea. Let me know if you are interested. Hopefully I will have more to show for the second half of February than I have the first half! I actually did it--I finished something this month. So many things are "almost" there, but I got one of them across the finish line. This is my Mini-of-the Month with Wendy over at The Constant Quilter blog. 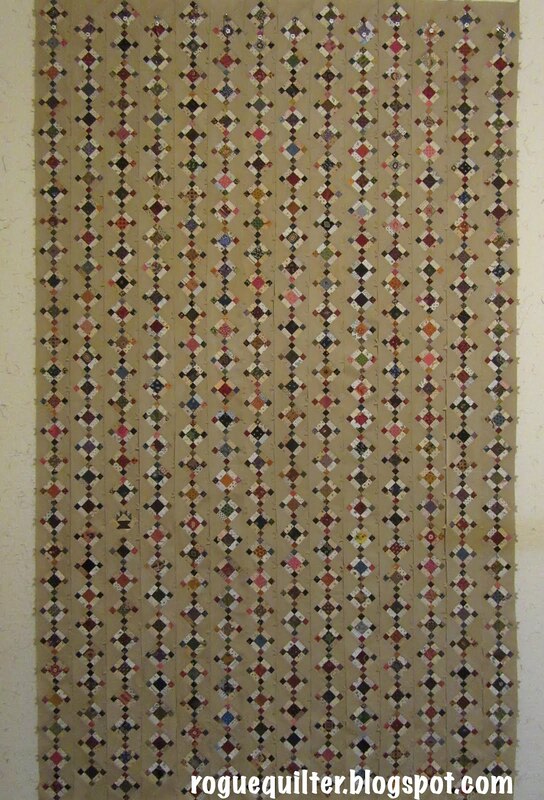 It is from a Pam Buda pattern in Journey Three of her Prairie Women's Sewing Circle. Her pattern called for 20 blocks, I made mine with 12. She named it "Light In The Window." I haven't named mine yet. I assembled this top in Oct. of 2016--over 2 years ago. It was a true "make do" project. In Pam's Sewing Circle Journeys, she encourages the "make do" principle used by our fore-mothers. When I was making this I had a bundle of small cuttings from Pam's Old Plum Calicoes line, and I was determined to use only those purples and shirtings. I pulled in the blue piece from another of Pam's lines. But working with that limited pile of purples (a fat eighth was the largest piece in the bundle--many were smaller pieces) challenged me. Four of the 12 blocks are "make do,"
and it took 2 different fabrics to make the outer border. I didn't have enough of the shirtings to make any more blocks--that is why I stopped at 12. I cheated with the backing and used a Judie Rothermel print in blue and purple that I love and had been saving for something special. I told myself I had to bind it with the trimmings from the backing. (I talk to myself a lot!) I don't often bind with a lighter fabric than the border, but we are making do here, remember? And I kind of liked lightening up the outer edge a bit. I thought I would have plenty of the leftover backing with which to bind, and I almost made it. I searched my stash for just one more little bit of this fabric--no luck! (I even looked online, just because I would have loved to have more of this.) And this is a "make do" quilt, remember? Look closely at the bottom edge of the binding in the photo above. In the middle you can see a seam a few inches long worming around the binding. That is made of two little leftover bits that weren't wide enough to be binding--I actually pulled them from the thread catcher on my cutting table. They were destined for the trash. And to the left of that part is a little section of another fabric leftover from one of the blocks. On the back you can see the seam in the pieced section, but on the front (below), that seam is not visible. This little top (created from blocks I made at retreat earlier this month) was the other project in the running to get finished for Mini-of-the-Month. But the blue/purple project had been waiting longer and needed its turn first. The pattern for this little quilt called for a lot more blocks than this, but I felt it was finished, so I bordered it and called it "done." At the moment I can't find the pattern to credit the designer, but I will hopefully have found it before I post about this quilt again. My design wall has been hosting these blocks for far too long now. At last sighting they were just separate blocks, with the top two rows actually sewn into rows. Now all of those rows are actually sewn rows, and the last two rows that are missing from the photo above are waiting beside my featherweight for their turn at assembly. I am going to do a border or two around this when the rows are all sewn together. This may be coming off the wall soon (except for the fact that I really stall when it comes to borders). In one of my "what was I thinking?" moments, I signed on for the Kim Diehl BOM with our LQS. I have never purchased a BOM before. Who am I kidding? When will I make this? But I love it--however, I am already designing alternative corner blocks in my mind. I do hope everyone in the path of the Polar Vortex is able to stay safe and warm! My prayers are with you.